A 130-foot white band lines canyon walls at Lake Mead, Nevada, in 2014. The water has sunk to its lowest level since 1937. It’s not clear how much more water people in Tucson and other cities can conserve to bail out the drought-stricken Colorado River. At some point, we’ll hit a wall at which more conservation won’t be possible. It will be difficult, if not impossible, for the region to limit the growth that threatens to outrun the water savings achieved by conservation. Those points were made by one of the overseers of a new federal report on coping with the overallocation of the Colorado, Kathleen Ferris. The Colorado River Basin supplies water to about 40 million people (including residents of Tucson and Phoenix) and to 4 million acres of farmland in seven states — California, Arizona, Colorado, New Mexico, Nevada, Utah and Wyoming — as well as to people and farms in part of Mexico. Ferris has a long pedigree in Arizona water issues. In the late ’70s, she helped write the legislation that in 1980 became the pioneering Groundwater Management Act. In the ’80s, she was chief counsel and later director of the Arizona Department of Water Resources. She’s now executive director of the nonprofit Arizona Municipal Water Users Association. Here, she answers questions about the new report, called “Moving Forward,” of which she was a co-chair of a conservation task force. Q. The report says cities plan to conserve more than 700,000 acre-feet of water over the next 15 years, on top of the 2.4 million they had conserved between 1980 and 2010. But do we really know what the potential for urban conservation is at this point? A. The report just gives you a highlight of what some cities are doing, an estimate of potential savings. But it’s not intended to be the bottom line by any stretch of the imagination. For Arizona, we don’t have goals yet for conservation because we don’t have the fourth management plan for the various cities that’s required by the groundwater law. (Due to budget cuts, the Department of Water Resources is well behind schedule in preparing that plan.) It’s almost impossible to estimate for Central Arizona what the future conservation savings will be. There will be savings, but we don’t know how much. Q. A lot of water officials like to say that we can’t solve our water problems with conservation alone. So at what point will we have to go beyond that and start proposing water projects to bring in more supplies? A. This is a very hard problem. Many innovative solutions need to be found. We clearly have conserved a lot over the last two decades, and will conserve even more going forward. At some point, we will reach a demand hardening at which you can’t conserve any more. Then we get back to tough choices about quality of life and smart growth. We don’t know where that point is. Q. With new supplies, almost anything you try to do will be controversial, right? A. It’s going to be that and it’s going to be expensive. Q. Where does the quality of life issue play into this? A. It was discussed a lot in our work group about, ‘How do we get people to convert from turf to lower water-use vegetation?’ We’ve been very successful at that in Arizona because we live in the desert, in an attractive natural habitat. In Denver, we hear people say that the public isn’t used to this and wouldn’t be accepting of getting rid of lawns. There are always trade-offs, and that’s why it isn’t fair to compare what goes on in one location with another one. Q. A lot of the conservation we’ve had has been eaten up in terms of overall water savings by new growth. Is there any hope for a change in that trend? A. There’s some. The report shows that while the region is using more water than in 1980 due to population growth, since 2000, municipal and industrial uses have remained stable or decreased. A lot of big changes take place when people convert to low water-use landscaping and they change fixtures at home to lower water-use appliances. That’s been the driving reasons we’ve had the kind of savings we’ve had. Obviously, we can only do so much of that, and you also have to factor in water use by businesses and industries, which is hugely important to a thriving metro area and economy. Q. Could the river get in bad enough shape that we would have to limit growth to keep it from getting worse? A. My personal feeling is that this is very hard to do. We live in a country where people are free to move where they want. Municipal water providers — their job is to provide clean, safe, reliable water supplies to their customers. They don’t have a say about who moves there. Their governments have a say about density, what kind of plants you can plant, but beyond that, not much. Q. What is an alternative to limiting growth? A. People need to start a dialogue of what they want their future to look like. We don’t tend to do that very well. The thing we did with the Groundwater Management Act here was to say that you need to get water before you develop. We’re the only state in the country that does that, requiring an assured water supply before building new homes. I think that needs to become a growing mindset. Q. But that law has a loophole, allowing developers to build and pump groundwater from under their subdivisions if they pay to have renewable supplies recharged somewhere else. A. I hate those loopholes, and I’ve been fighting against them for the last 10 years. It’s also important to protect peoples’ investments in water rights. That’s not something people like to talk about. Cities and farmers, they all made investments in using their water supplies. You just can’t take those investments or take those rights away. Q. 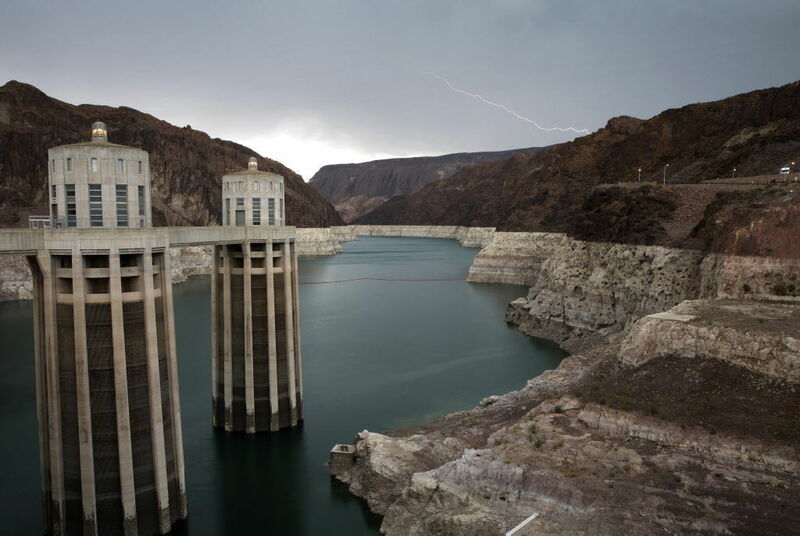 Is there anything to feel optimistic about regarding the Colorado River? A. Just the fact that people are taking this seriously and spending as much time as they have been looking at the problem and the potential solutions is reason for optimism. You can’t solve problems if you ignore them. Contact reporter Tony Davis at tdavis@tucson.com. Three UA scientists signed the letter to Interior Secretary Sally Jewell.